My son probably thinks this place was made just for him. It was hard getting him in the door. In front of the main entrance stand two collossal life-sized sculptures by the late sculptor Dave Thomas. An Albertosaurus towers over a squat Torosaurus. Once inside, the aspiring junior paleontologist is surrounded by critters of every description. 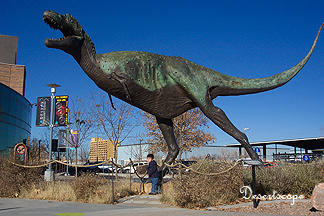 A relatively small Coelophysis sculpture appears to be hunting small game, while an Allosaurus skeleton of intimidating size glares down at the visitor. Following a path designated by arrows and signs, the visitor is led through the development of the Earth over the course of hundreds of millions of years. As we traveled the path, my son made a point of guessing the name of each and every ancient creature. 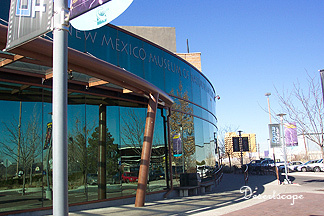 I was surprised not only with the extent of the collection, but also with the fact that so many representatives of the Age of Reptiles were found right here in New Mexico. In the Jurassic period, my son was dumbstruck as we entered a large open room containing three spectacular displays. The skeleton of a Seismosaurus stretches the length of the room. In an aggressive stance, a carnosaur appears to be hunting the massive sauropod. The scale of life at that time really shows when we see the leg bones of a Brachiosaurus. These bones dwarf even those of the giant Seismosaur with whom they share a home. 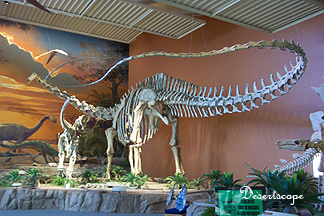 The dinosaur displays end with a display of the dominant impact theory of the great extinction that ended the Cretaceous. The video and animatronics repeat every few minutes, and I had difficulty dragging my son away (in fact, he felt compelled to tell me about it periodically for the next week). The giant Quetzalcoatlus above and the Mososaur below round out the museum as monument to the great animals of the distant past. Life did not end with the dinosaurs, so neither did the exhibits. The tour continues on through the Age of Birds, following the development of mammals, from early horse ancestors, through to those mammals that inhabited the region at the coming of man a few thousand years ago. The collection includes models, fossils, and actual bones of the great and small mammals up to Paleolithic times. The journey through time ends with the skeleton of a large mastadon towering over the skeleton of and sabertooth cat.